You guys, I love engagement sessions. The couple portraits during a wedding are one of my favorite parts, so engagement sessions are just like my favorite part of a wedding every time I do them. However, this one is extra special to me, because Josh and Maggie are two of my best friends from high school that have been dating for over 5 years, and now THEY'RE FINALLY ENGAGED! And as a bonus, I get to be the maid of honor, and finally be in a wedding. (Every time I shoot weddings I always think about how much fun it looks to be a bridesmaid! Now I finally get to!) Taking their engagement photos was a total honor and we had a blast running around at Tubbs Hill for sunset in Coeur d'Alene, Idaho. Additionally, Josh and Maggie brought their corgi, Winston, and I cannot say this enough: if you have a dog and want to bring them to any of our shoots together, I. WOULD. LOVE. THAT. Your pets are a part of your family and I'm totally down if you want to include them! The icing on the cake of this shoot is that I convinced Josh and Maggie to jump in the lake at the very end! Josh is full of good puns so the joke was that they were "taking the plunge". 😋 I'm always so stoked when my couples want to do something different or fun for their shoots and this definitely lived up to "fun and different"! 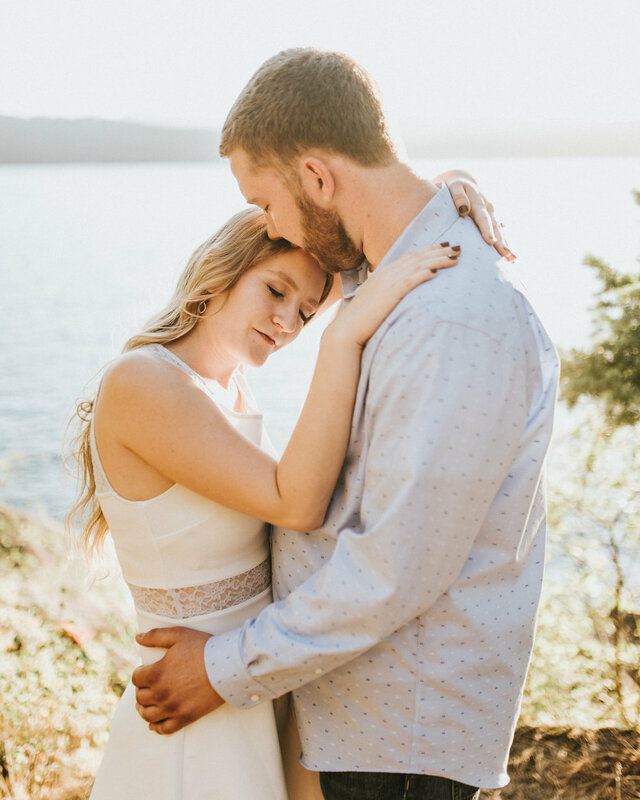 I'm so happy that I got to capture these two lovebirds, and I'm even more excited to help them plan their wedding and be a part of it this winter. Congrats Josh and Maggie, it's about time!